Regardless of where your home is located in the area of what is known as North Phoenix with such beautiful communities as Desert Ridge, Tatum Ranch, Desert Peak, Mountain Gate North, Dynamite Estates, Tatum Highlands, or one of the dozens of communities that make the North Phoenix area an incredible place to live, in most cases, your most important asset is the place that you call home sweet home, and if you are like most of us, you take great pride in maintaining your home. If are considering a remodeling project for your home, whether it is a full home remodel, kitchen remodel, bathroom remodel, back patio remodeling, or one of a dozen remodeling projects regarding your home, your first priority is to hire a General Contractor who not only has the experience and expertise, utilizes only the top-tier sub-contractors, superior products and materials, but also has that rare ability to take what a client envisions their remodeling project to look like and make that vision into a reality. 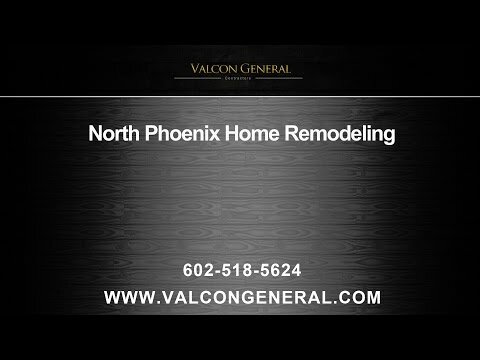 This is why so many people who live in the area of North Phoenix choose Valcon General as their North Phoenix remodeling contractor. It doesn’t matter what type your North Phoenix residence is: a sub-division house, a custom built house, a townhouse or condo, for all your remodeling projects, Valcon General is the home remodeling contractor who can handle all types. If your remodeling project entails remodeling your kitchen, Valcon General’s ten plus years experience in this area will be an advantage for your project, plus with their expertise, there are virtually no limits to what your dream kitchen can look like. In talking kitchen remodels, one of the first steps is choosing cabinets. If you are looking to remodel your master bath, whether that would be a complete remodel or for your guest bathroom, Valcon General, along with its sister company, All Vee’s Plumbing Services, has you covered. We can help you design your master bath or guest bathroom with incredible choices of shower and bathtub settings, walls that can be designed with almost every texture and color you can imagine, hundreds of faucets to choose from, along with dual showerheads and finishes to match. Again, we recommend custom-made cabinets, and we can find the perfect flooring to enhance your style, making your bathroom a one of a kind. Now, if your remodeling project is a complete home remodel, entailing all the rooms, or a patio remodel so you can enjoy those wonderful Arizona days and nights, Valcon General is the perfect fit for your project. With every project, we insist on taking the time to sit down with our clients to design a plan to ensure that clients are totally happy with their remodeling project and would gladly recommend Valcon General to their friends and family. At Valcon General, we never use the cookie-cutter approach; we feel each project should have its own unique style and feel. Over the past ten plus years, Valcon General has worked long and very hard to earn a reputation for professionalism, with their number one concern being client satisfaction which is evidenced by the large number of referral clients we work with each year. If your custom home, sub-division home, condo, or townhouse is in Fireside at Desert Ridge, Tatum Highlands, Mountain Cove, Summit Ridge, Dynamite Estates, Tatum Ranch, or anywhere in the North Phoenix area, and you are considering remodeling your home, we would welcome the opportunity to work with you on your next project. Experience firsthand, the Valcon General difference! We think you will be happy you did!